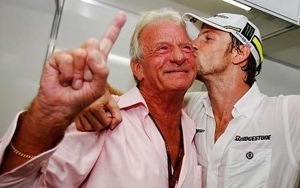 It was with great sadness that I heard of the passing of John Button. It’s a great credit to John that people right across the paddock have stated his great ability to know when to stay in the background. If I had a pound for every time I had heard from a Motorsport buddy about the negative influence many a young drivers parents can have on their sons career I’d be fairly well off to day the least. From the overpowering influence of those trying to live their dreams through their offspring, to the chap that thinks he can engineer his son or daughters car better than the highly qualified teams around them, Motorsport has seen them all. The great thing for any parent is to see their child achieve a target or a lifetimes ambition,. If we can be thankful for anything, it’s that John got the time to enjoy Jensons world champion year. Not only that, but seeing his young JB pull off some of the great wins of the modern era. I witnessed first hand in Barcelona just how many people in the paddock had time for John, watching him take about 15 mins to get from one end to the other. Stopping to talk to people who he’s come to know over the years. He was perhaps a lesson to all of us that are lucky enough to be parents. Sometimes your greatest gift is knowing when to push and intervene but equally, when it’s time to sit back and let them get on with it. It’s a lesson that many Motorsport parents could take heed from. So we will see many glasses of red will doubtlessly be raised to John later in the month when F1 gets back down to business at Jerez. Rest in peace John, you will be sadly missed.